September 19, 2018 ckeating General, Perspective, Uncategorized, Writing Comments Off on Are You Kidding Me? March 21, 2016 ckeating General Comments Off on When the Mountains Call…. Falling Off the Grid…. and Loving It!! 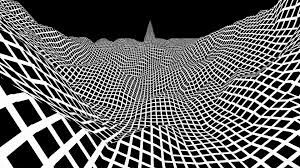 March 9, 2016 ckeating Uncategorized Comments Off on Falling Off the Grid…. and Loving It!! January 4, 2016 ckeating Brain Injury, General Comments Off on You Go Girl!! A year, an entire year has roared by without a word shared in this forum. Unconscionable really, was my first thought as I realized how long it has been since I dove into this passion of mine. Life is without a doubt moving quickly, but life it is, and every single minute of it is one to be reveled in. The thought also crossed of how a stories or ideas desperate to be shared have been slowly building, anxiously waiting their moment of expression. As I sit here typing this I am wholeheartedly looking forward to getting back on the literary track. I am in the middle of writing my second book and have two others in mental queue waiting to be dealt with. I find such joy in rummaging through the repository of thoughts, feelings and ideas that are waiting just under the surface. At odd times I feel drawn to put down what I am doing and take the time to head for the closest pad of paper. Unfortunately, or maybe not, I have a life that is full and fast moving in so many ways. So much to do, yet never enough time it would seem. My first reaction is one of frustration, but then I am aware that there is a time for all things. I am in the middle of writing my second book and have two others in mental queue waiting to be dealt with. I look very much look forward to progressing along with each of these projects. I have once again gotten the itch to jot down more than a few thoughts. I’ve also found myself musing over and over on familiar topics. In addition, have caught myself more than a few times imagining myself making my way to a quiet place to sort through my thoughts and ideas. It’s official folks, the writing bug is back!! So, what to do? Carry on as if it’s business as usual? Continue to fight the urge that is almost screaming inside at this point? Nah, I think not. 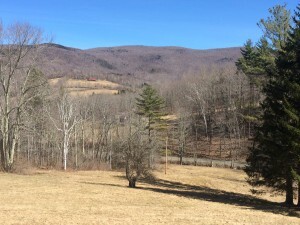 I’m excited to say that I’ve booked 5 days at my retreat in the mountains; my best hope to get back on track. If you still haven’t read my first, it is available in a variety of venues! 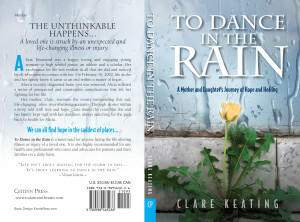 To Dance in the Rain – A Mother and Daughter’s Journey of Hope and Healing is available in 6 bookstores. 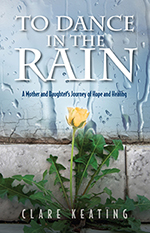 The Northshire Bookstore – 4869 Mani St. Manchester Center, VT.
To Dance in the Rain is also available for online purchase through Kindle, Nook, ibookstore, Goodreads, Kobo, Scribd, Barnes and Noble, Baker & Taylor, Flipkart, Copla, Gardiners, eSentral and Ciando. The book is very reasonably priced for ebook purchase. It can also be purchased directly by calling Ceitinn Press directly at 860-417-9041. I would again like to remind you that there is a 20% discount on the purchase of To Dance in the Rain for bookclubs and on multiple orders! I am so very grateful to everyone who has joined us on our journey, as you have read To Dance in the Rain. Many of our favorite nouns (persons, places and things) have taken a back seat as we have dealt with one unforeseen circumstance after another. And yes, as you may have surmised, much of it has not been positive. Here we are though, almost to the half way mark of the year, one that for me now signifies a new beginning. 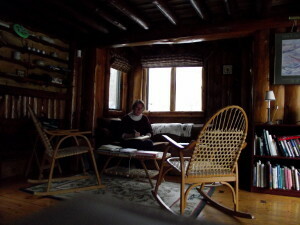 This marks the spot where I get back into writing and doing many of the other things that bring me happiness and peace. Promise fills the air as does the sunshine that is peaking through the blinds at the dawn of each new day. Life and the beauty and enjoyment of it all, is right there in front of me, in front of each of us. It is time to get back to what we all love and cherish, back on track. For lack of pretty much anything else to do over the past couple of months, I have gotten back into writing with a new level of passion. The less I have on my mind, it would seem, the more my mind fills with new and exciting ideas, insights and stories. Funny how that works! To be fair though, my perception of exciting is many times oh so slightly different from, ok…everyone else on the planet. 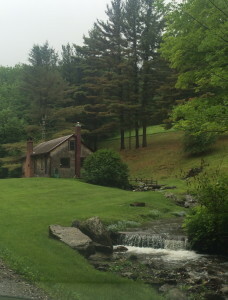 So off I ran again to my hideaway in the mountains; solitude was calling me! Interestingly enough, being entirely alone for me never brings the feeling of loneliness. There is something about being immersed in the excitement of new ideas, the formation of thoughts into stories and listening to the wisdom within as well as that surrounding me in nature that lends to an amazingly rich and exciting experience for me. 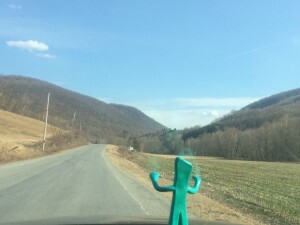 While basking in the solitude in the mountains of south western Vermont, I realized how I had gone there to get away from it all, but actually got more deeply in touch with all of it. 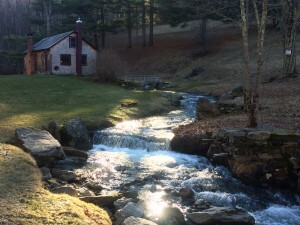 I have always found this cottage to be a place of retreat. 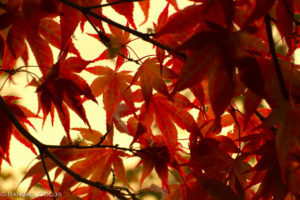 The pleasant surprise comes in the realization that the peace and wisdom gained there keeps getting better and better. Each time easier to jump into, each time taken to a new depth within. While I love a fair number of individuals on this planet, some of my best days have been ones which have been spent entirely without any interaction with other humans. I find both states of presence equally as enriching. There were many present moments as I needed to recharge and take my energy levels up past the full line once again. Trust me, I have been down a few quarts in recent times. Stillness has a powerful presence; it filled every corner of the cabin. It seeped into my soul and healed me body, mind and spirit. We could also talk about the mountains, but they don’t need me explaining them to add to their splendor… they were as always, breathtaking. I packed up the car once again and brought back more than a little peace and contentment. If there is anything that I would like to share with my friends, it would be an idea or situation that speaks of peace, fulfillment and joy. Will be busy writing and relaxing and writing and loving life and writing some more ! Well, the years have moved along slowly for Alicia and have been quite frustrating at times, I might add. You can’t help but feel for the girl at times, as she can only imagine where she might be or what she might be doing at this point in her life had she not had a brain injury at the age of sixteen. To be honest with you, I at times try to put thoughts of the past including all the sadness out of my mind; they are still quite painful. I can not even imagine how discouraged and tortured Alicia has been by these thoughts. Many of those close to her are called to carry out their lives; daily concerns and ideas fill our minds. Alicia, though, wakes up each morning with a day ahead that is just not quite what she had hoped it could be. She can’t do many of the things that we can do on a whim, like head out in the car, visit a family member or a friend, go shopping or just do something spontaneous by herself. That is the type of soul that she has inside that body with it’s limitations…one that called to live life to the full. There have been a variety of obstacles along the way that have contributed to diverting from the road to conquer new goals. Ones which would have helped her to move forward toward a life filled with more of her dreams being met rather than not. They are all water under the bridge at this point. A bridge that she poises herself beside, longing to jump into the water and take the ride of her live. Alicia has patience about her that I have never seen before; you can see and feel a special kind of acceptance when you are with Alicia. Some of it might be quiet resignation, keeping her feelings close to her heart rather than on her sleeve is also part of her charm. At times I see a rekindling of hopefulness in Alicia; call it determination, maybe even defiance. It comes in waves, and we are currently riding a big one. This past year Alicia verbalized her dream to walk again and she has been working on doing just that slowly but consistently. 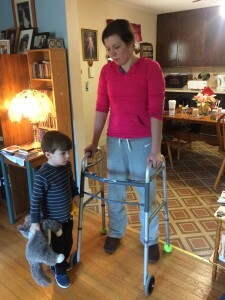 Anyway, Alicia has been walking with the ‘old people’ walker again within the last week. I have also noticed a bit more equilibrium and solid stance lately when we have been walking short distances with her arm over my shoulder. She seconded this new feeling of stability. So we tried it, and …. guess what?! Yeah, she did it! Alicia has been walking with more focus to detail with each step and it’s working. She has just taken a giant step toward her goal of walking again. I think she’s got this! !